Alexander de Cadenet’s sculptures raise important questions regarding what and how much we consume. His Life-Burger sculptures in particular explore the relationship between the spiritual dimension of art and consumerism and investigate what gives life meaning. Los Angeles art critic Peter Frank has stated that, "We're at a moment in modern history where the excess has gotten staggeringly wretched. Oligarchs worldwide shock us and shame themselves with their conspicuous consumption – a consumption that extends to the rest of us, as consumed no less than as consumers. Alexander de Cadenet encapsulates this emerging neo-feudal order in his gilded and multi-decked burgers. For the meta-rich, the world is their fast food joint, and their appetite insatiable." We can see this at play in another key work, Creation, a large scale shiny bronze apple with three bites taken from it – two adult bites and baby bite in between. This clearly references the second Creation story in the Book of Genesis, where Eve is tempted by the serpent to eat the apple from the Tree of the Knowledge of Good and Evil, which Adam and Eve had been forbidden to eat. Adam also eats the apple (the second adult bite) but when challenged by God passes the buck to Eve, who then puts the blame on the serpent. The Genesis Creation stories can be read as descriptions of key human tendencies such as our grasping after those things that we have been told we should not have, our willingness to cross boundaries to acquire them and our refusal to accept personal responsibility for our own actions when we are found out. There is a clear link between these characteristics and the consumerist desires that are satirized in the Life-Burgers. The biblical witness is that these desires characterise every generation. This may be why the baby bite appears in De Cadenet’s Creation as an indication of these tendencies arising in future generations as well as current ones. His intention was for the apple sculpture to say something of the transformative power of art by using the Christian symbol of temptation, “In Genesis we were told by God not to take a bite from the apple, yet it was by taking a bite that we became ‘self-conscious’ and self-consciousness is what is necessary for making art.” By eating the fruit Adam and Eve gained knowledge of good and evil, which enables us to create, but which also means that our creativity can be used for good or for evil. 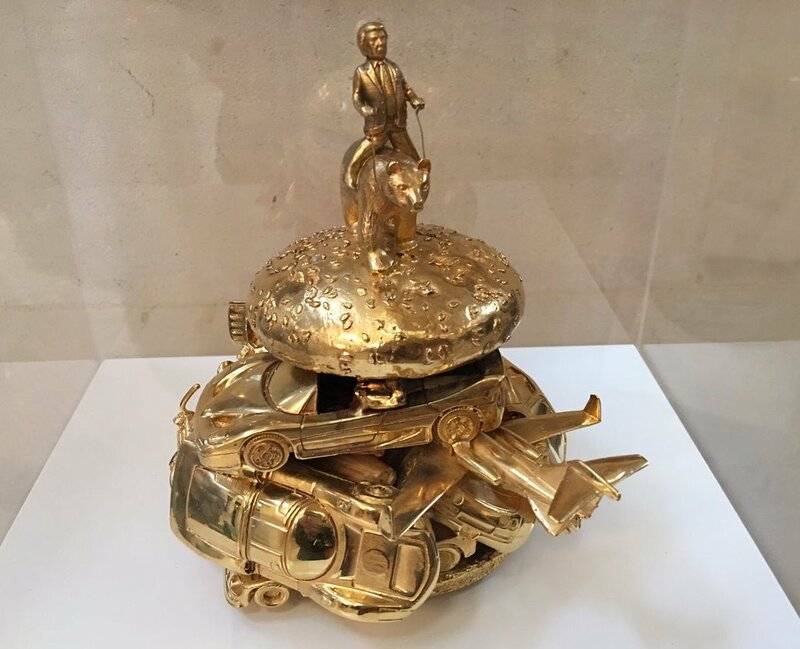 Alexander de Cadenet: Trump Burger 2, 2017, solid silver with gold plating, 18 x 23 cm. 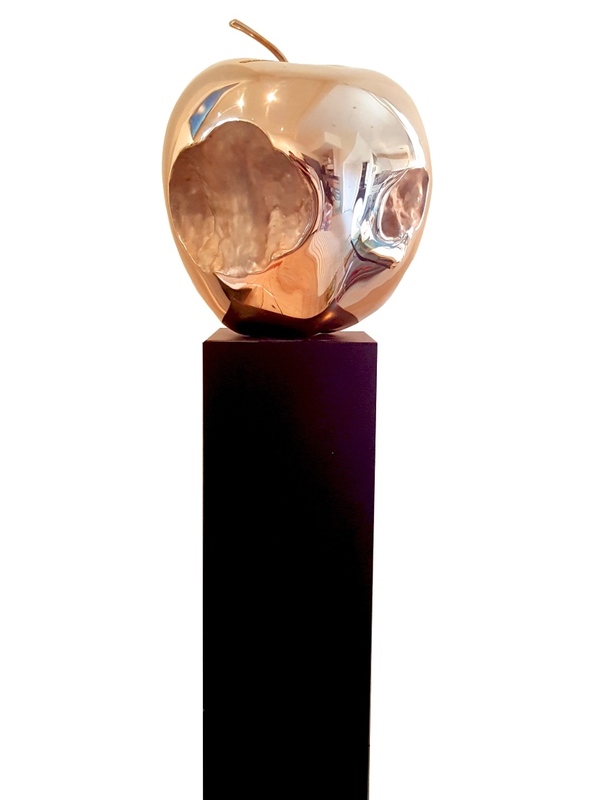 Alexander de Cadenet: Creation, 2015, bronze, edition of 20. Jonathan Evens is Vicar for Partnership Development at St Martin-in-the-Fields, London, England. A keen blogger, he posts regularly on issues of faith and culture at www.joninbetween.blogspot.co.uk. His journalism and art criticism ranges from A.W.N. Pugin to U2 and has appeared in a range of publications, including Church Times. He runs a visual arts organisation called commission4mission, which encourages churches to commission contemporary art and, together with the artist Henry Shelton, has published two collections of meditations and images on Christ's Passion. Together with the musician Peter Banks, he has published a book on faith and music entitled The Secret Chord.